I while ago I had a reader ask about my tempeh ragù recipe. Shouldn’t that be ragoût? To be honest, I wasn’t sure. I had a momentary freak out over the possibility of naming my recipe after a familiar brand of jarred pasta sauce. It’s okay though. I Googled around and from what I understand, they’re two different things: a ragù being a meat sauce, and a ragoût being a kind of loosely defined stew with lots of stuff in it. Anyway, that’s sort of what Food & Wine had to say about the issue. 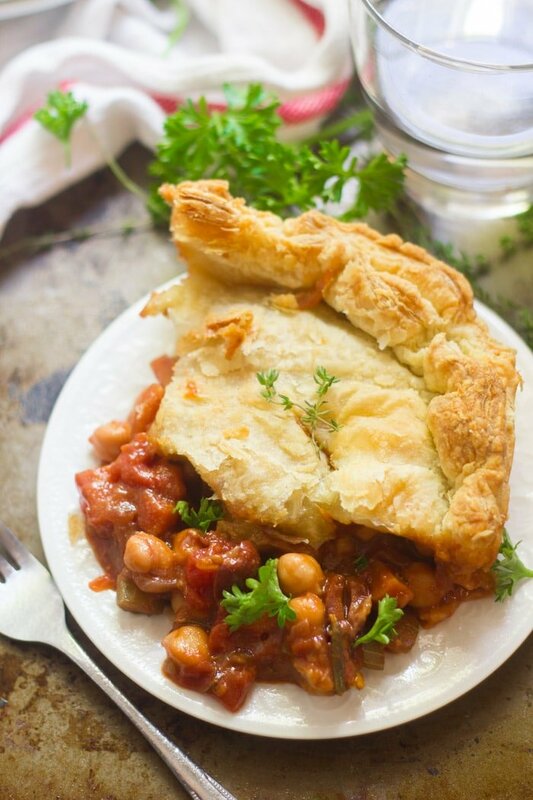 Puff pastry has quickly become my favorite savory pie crust, not just because it’s delicious, but also because lots of store-bought brands are accidentally vegan. And this pie has a top and bottom crust, because I used a top and bottom crust in another different but intensely flavorful pot pie a while back, and the way the layers of crust just hug the fillings is so perfect. This is a hearty, wintry meal, but hey, winter is coming, right? Actually, the new season of Game of Thrones just became available on Amazon and this was my husband’s and my celebratory couch dinner for the first episode. It was perfect. A savory mix of herb and wine simmered chickpeas, veggies and olives is stuffed into a puff pastry crust and baked to flaky perfection to make this hearty vegan pot pie. Coat the bottom of a large pot with oil and place it over medium heat. Add the onion, celery and carrot. Sauté for about 10 minutes, until the veggies begin to soften. Add the garlic and sauté about 1 minute more, until very fragrant. Add the wine and bring to a simmer. Lower the heat and allow the mixture to simmer until reduced by about half, about 5 minutes. Stir in the flour until it coats the veggies evenly. Stir in the broth, olives, tomatoes, tomato paste, thyme, rosemary and bay leaves. Bring the mixture to a simmer and allow to cook for about 15 minutes, until the veggies are soft but not mushy. Remove from heat. Remove the bay leaves, then stir in the chickpeas and season with salt and pepper to taste. Preheat the oven to 400° and lightly oil an 8 x 8 inch baking dish. Roll one sheet puff pastry to a square large enough to cover the side and bottom of the dish. 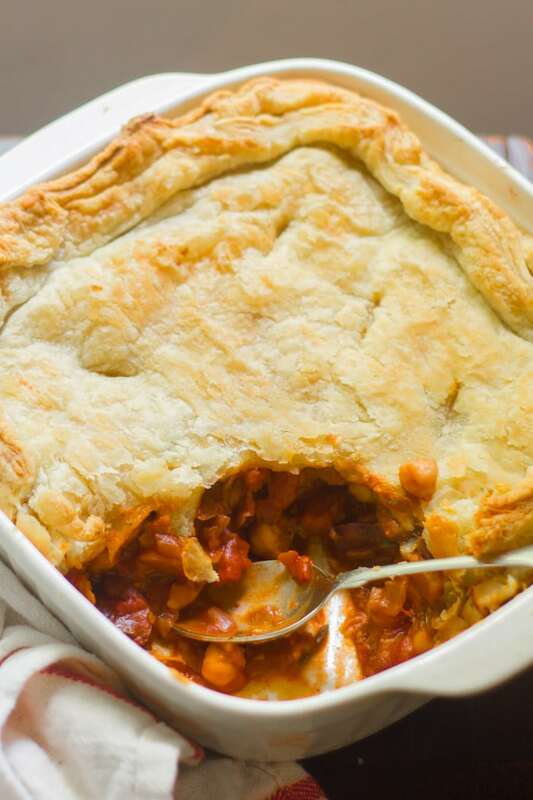 Arrange the sheet to cover the inside of the dish, then pour the stew into the dish, over the puff pastry layer. Arrange the other puff pastry sheet over top and pinch the edges with those of the bottom sheet. Trim any excess puff pastry that hangs over the edges. Brush the top sheet with olive oil and cut a few slits into it with a sharp knife. 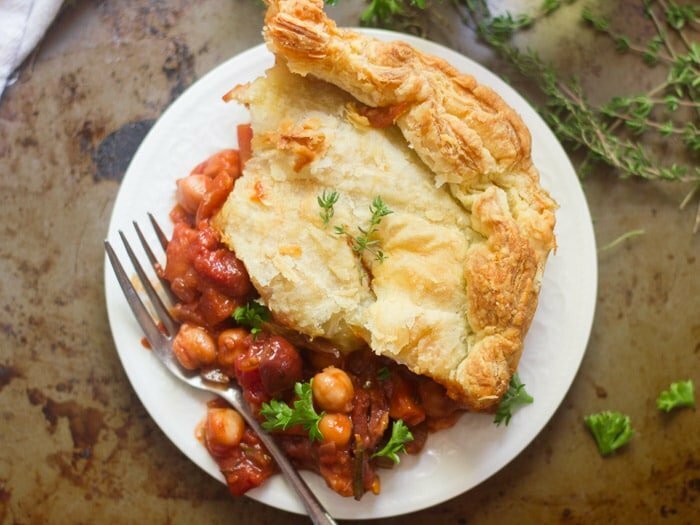 Bake until the puff pastry is puffy and lightly browned, 30-35 minutes. Remove the pie from the oven and allow to sit for 5-10 minutes before cutting. Serve. I love pies! And this filling looks delicious. I’m going to bookmark It for when it’s a bit cooler! Planning to make this on Christmas eve, not sure if my two sis in laws like olives… do you think if I omitted them it would totally change the flavor??? Thanks, excited to make! I think it would still be tasty without them. :) I hope you enjoy it!! First day of Spring and we’re expecting a pretty decent snowstorm. Sounds like a perfect excuse for this hearty, delicious stew. The only thing I plan on changing is adding mushrooms, because I have some that are needing to be used up before I have to toss em in the compost pile. Very excited about this one. I’ll let you know how it turns out for me! Wow, adding mushrooms sounds tasty taste-o! Let me know how it turns out! Just made it and it was amazing. I made it only with the top crust, as I didn’t have enough puff pastry for both, but it came out great anyway. I also used fresh tomatoes instead of canned (peeled and seeded) so I had to use a little sugar to counteract the acidity. It came out great, mostly, I think, because of the wine. 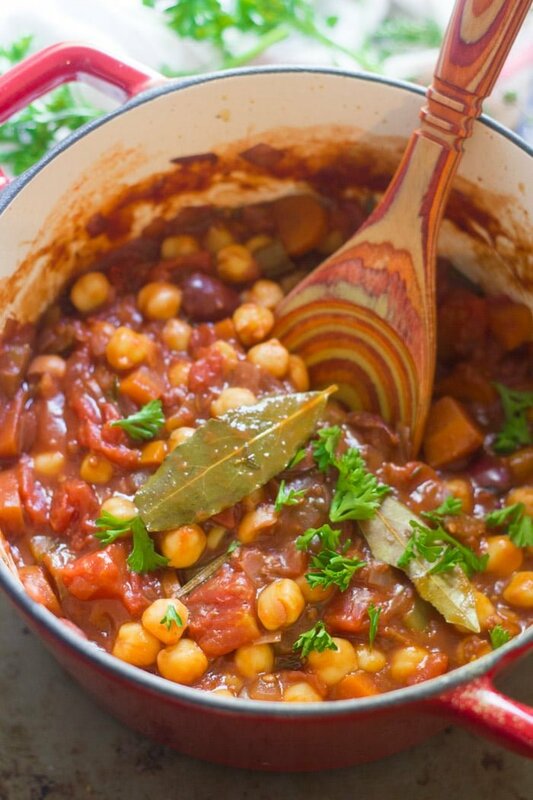 I love this ragout, I’ll try having it with cuscus and parsley. That sounds like a delicious meal! I’m so glad you enjoyed this!